Although an overwhelming majority of organisations (around 70 percent) aspire to have an inclusive culture driven by committed and inclusive leaders, survey results report that most companies have not progressed beyond a programmatic approach to diversity and inclusion. A programmatic approach is characterised by ad-hoc interventions and initiatives without a corresponding shift in mindsets and behaviours. For example, a programmatic approach is evidenced in a firm that has a parental leave policy that does not distinguish between primary and secondary carers yet fathers in the organisation are much less likely to use their parental leave entitlement compared with mothers. While best practice programs and policies are important, they remain tick-the-box initiatives unless there is corresponding cultural change. In my work. I look beyond the intentions of diversity and inclusion programs and policies to their impact. Assessing the impact of diversity and inclusion efforts can be achieved by analysing engagement survey scores by monitored group or through qualitative employee focus groups that tap the lived experiences of employees regarding the four factors of inclusion—respect, belonging, empowerment, progression. Exit interviews are an additional source of information about the experience of diverse employees. Those three data sources are useful in assessing whether some groups of people in the organisation are less satisfied and committed to the organisation than others and the reasons why. Observable patterns in engagement scores and themes arising from focus groups and exit interviews evidencing that diverse talent is less satisfied with their organisation and its leadership are often surprising to leaders. Leaders, in particular, those from the dominant group in the organisation, may struggle to understand why their intentions regarding diversity and inclusion are failing to translate to positive experiences for their diverse workforce. Because of the unconscious and hidden nature of bias, it can be difficult for leaders to appreciate that individuals with backgrounds different to their own experience the workplace differently to them. Some findings may be particularly confronting for leaders. For example, learning that your diverse talent experience bullying and harassment frequently, or are concerned that they are not paid fairly, or are anxious about and refrain from speaking up in meetings. Leaders can also be shocked to learn that subordinates view their commitment to diversity and inclusion as insincere or inauthentic or that their leadership style and choices favour some people over others. Fortunately, there are some tools that can help leaders see themselves as others see them. The Intention–Perception Model of Communication is employed in leadership coaching to help leaders improve their effectiveness by considering the gap between what they want to communicate and achieve and what is perceived and experienced by employees. The model shows how good intentions can get lost in translation. It’s a little like the children’s game Chinese Whispers – there is a breakdown in communication, and the leaders’ intended message becomes distorted. As the distorted message circulates, it becomes further distorted and loses all resemblance to the original message. The educational value of Chinese Whispers is that it shows how easily information can become corrupted by indirect communication. Third, based on their perceptions and their past experiences and their existing understanding of the world, followers’ interpret (assign meaning) to leader behaviour, and those interpretations may not align with the leaders’ intended message. Every moment, we take in through our senses – sight, sound, smell, touch, taste – thousands of items of ‘data’. In themselves, these have no meaning at all. It is through interpretation – assigning meaning to what we perceive – that we make sense of our worlds. These interpretations become our reality, and they might not be what was intended by the sender. Interpretations are important because they trigger emotions, which are broadly either ‘positive’ or ‘negative ’. Positive emotions trigger approach behaviours (engagement) whereas negative emotions trigger avoidance behaviours (disengagement). As an example, a leadership intention might be to increase the representation of women at senior levels of the organisation. Reflecting this intention, behind closed doors, there is an active search for female candidates to fill an open position. When this action does not result in a female hire (for whatever reason), the leadership team remains largely homogenous. The consequence is that the workforce see/perceive a male-dominated leadership team. This is interpreted by women in the workforce as evidence that women are not valued and cannot progress to senior roles. Further, the predominately male leadership team is perceived to be insincere regarding its verbal commitment to gender diversity. The emotional result is disengagement. Like Chinese whispers, the consequences of a small initial misinterpretation can be significant over time: small misinterpretations grow into large misunderstandings, which grow into false stories, which ultimately erode trust, credibility, and transparency, all of which negatively impact engagement. 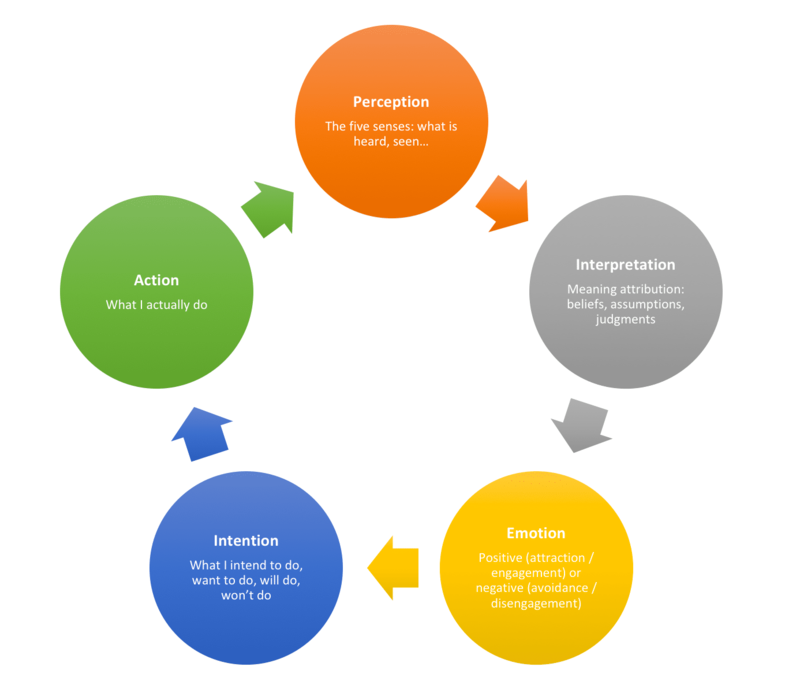 The Intention-Perception model reminds us that to effectively communicate, we must realise that we are all different in the way we perceive and interpret the world and use this understanding to improve our communication with others. Dismiss or challenge the interpretation. This approach is risky and likely to fail. Rejecting or dismissing another person’s reality and experience doesn’t alter their experience and could even make things worse. If leaders argue against a pervasive perception that women are undervalued and not supported without offering any evidence that is the case, their statement will be interpreted as another example of insincerity, further eroding trust. “You keep saying that, but you don’t mean it.” Rejecting another person’s reality is a particularly risky approach when they are receiving a strong message to the contrary. For example, if women experience multiple events that suggest women are undervalued at work (e.g., pay inequity, causal sexism) in addition to a predominately male leadership team. Build a context in which a contrary or different interpretation is possible. You do this by focusing on the gap between your intention and what the receivers of your message perceive and experience. This approach involves three steps: seeking to understand your counterpart’s reality, reaffirming your commitment, strengthening your messaging, checking interpretation. To build trust as a leader, you must first understand the experiences and concerns of those you are leading. This means making an effort to understand the lived experiences and the realities of your employees— what experiences and situations have led them to assign a particular meaning to what they see and hear in the workplace. Leaders should seek to understand the findings from engagement surveys, focus groups, and exit interviews. Leaders should also engage their subordinates directly to gather as much information as they can about the experiences and realities of the people they lead. Seeking and receiving feedback can be uncomfortable for leaders and negative feedback can trigger unhelpful responses such as denial, rejection, resistance, or backlash. To counter the risk of a negative response to feedback, leaders should approach learning about their subordinate’s experiences with an open and curious mindset. Adopting a learner rather than a judger mindset is useful. So too is adopting a growth mindset. When it comes to inclusive leadership, mistakes are inevitable. Learning about and managing biases and blind spots is a journey. Discovering that you have a bias or have done or said something that made others feel uncomfortable, does not make you a sexist or racist, but is a sign that you need to keep learning. Let go of the need to have to ‘prove’ how fair you are and accept that you will slip up and there is always more to learn. If you don’t take a growth mindset approach to inclusion, strong self-defence mechanisms that act to maintain a positive self-concept can get in the way of self-awareness and growth. The only way to grow as an inclusive leader is to acknowledge that mistakes and blind spots are inevitable and are opportunities for growth. Inclusive leadership involves vulnerability – opening yourself up to interpersonal criticism. You must be prepared to be uncomfortable, to be challenged, to have difficult conversations and to admit that you sometimes get it wrong. To address a gap, you need to define where you want to end up so that you can ascertain how far away you are from achieving that goal. A succinct and clear statement of your intention defines your end-point, aligns efforts, helps to prioritise initiatives, and offers a metric by which you can measure the success of your efforts. The success of any cultural change relies on leaders who communicate and model the changes that they want to see in their workplace. If leaders haven’t clearly defined and articulated those changes, they can’t successfully influence others. When you communicate what you care about, you influence others to care. 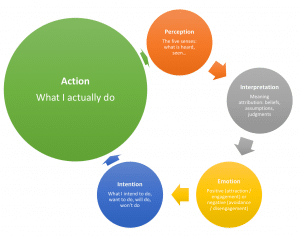 Below is an example to guide leaders as they construct their intention. Notice how the example references values, the desired impact on the lived experiences of employers, and how that will be achieved. To strengthen the messaging around your commitment to gender inclusion you have to take great pains to ‘walk the talk’. What prevents the maturing of a diversity and inclusion efforts into sustainable cultural change is that organisational leaders frequently underestimate their role in driving inclusion. The behaviours of leaders matter much more to diversity and inclusion success than they often realise. Studies show that inclusive leadership accounts for up to 70 percentage points of difference between the proportion of employees who feel highly included and the proportion of those who do not. This effect is even stronger for minority group members. Only by demonstrating a strong and consistent message on diversity and inclusion, can leaders shift perceptions and interpretations and improve engagement. Male Champions of Change and Chief Executive Women’s The Leadership Shadow is a helpful framework for helping leaders understand whether the message they are communicating is the one they intend, The Leadership Shadow prompts leaders to consider the strength of their messaging with respect to what they say, how they act, what they prioritise, and how they measure. 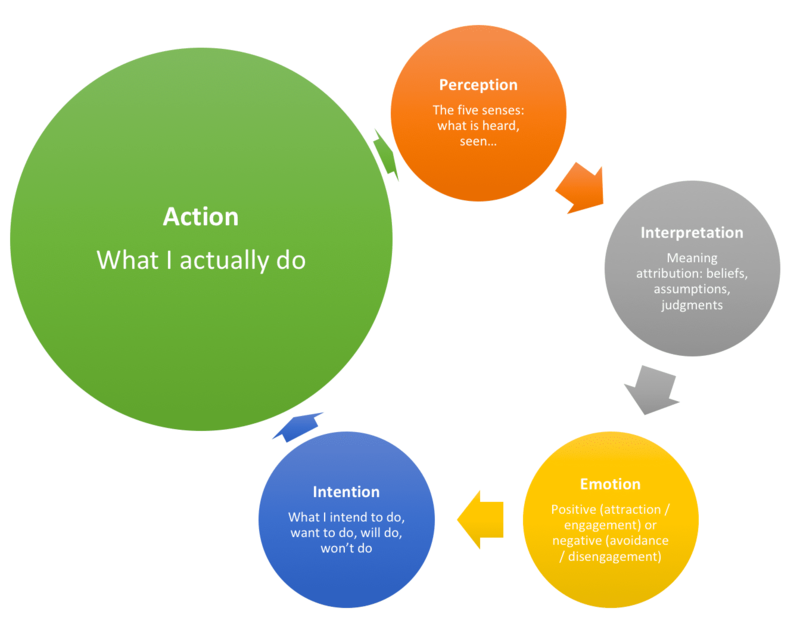 The intention-perception model reminds us that in communication we can’t assume that our reality is the same as another person’s, so effective communication requires us to check interpretation. 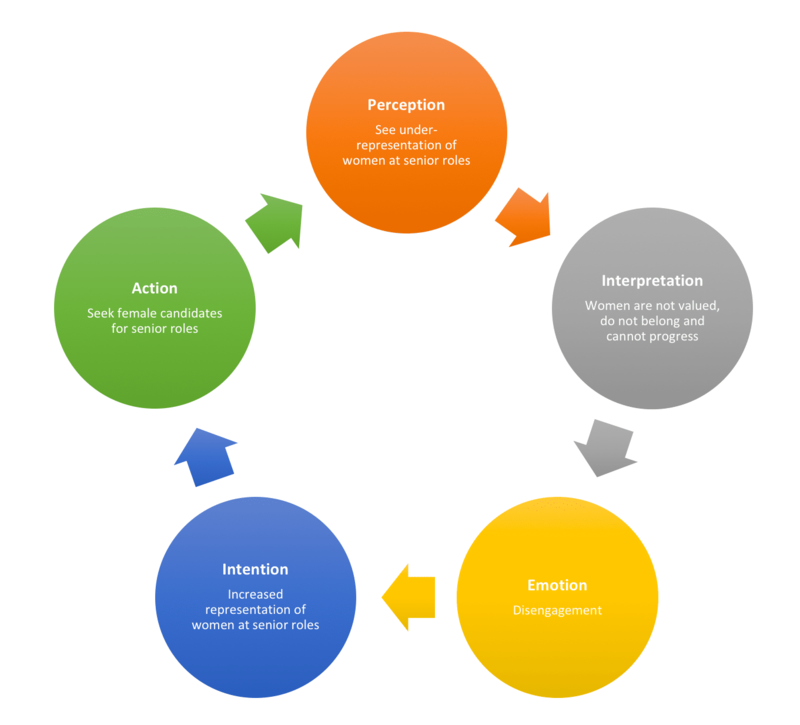 When a gap persists, leaders must repeat steps 1-4 until the impact of leader actions align with intent. Felicity Menzies is CEO and Principal Consultant at Include-Empower.Com, a diversity and inclusion consultancy with expertise in inclusive leadership, unconscious bias, cultural intelligence and inclusion, gender equity, empowering diverse talent. Felicity is an accredited facilitator with the Cultural Intelligence Centre and the author of A World of Difference. Felicity has over 15 years of experience working with and managing diverse workforces in blue chip companies and is a Fellow of Chartered Accountants of Australia and New Zealand. Felicity also holds a Bachelor of Commerce and a Bachelor of Arts in Psychology.